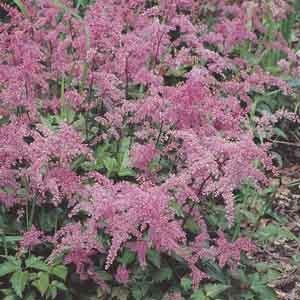 A charming dwarf Astilbe native to Japan. The feathery flower sprays add soft touches of color to shady areas and woodland plantings. Plant in groups of three or more for best effect. Finely cut foliage adds texture and interest all season long. Makes a dependable mixed border plant. Looks great in woodland settings. Ideal for specimen, foundations, and mass plantings. Especially nice in waterside gardens. Grow in fertile, humus-rich soil. Will tolerate sunnier aspects if given ample water. Remove faded flowers or leave for winter interest. Divide plants every three years for best performance.